West Town is extremely walkable, is convenient for biking and boasts excellent transit options, according to Walk Score's rating system. So what does the low-end pricing on a rental in West Town look like these days--and what might you get for your money? We took a look at local listings for studios and one-bedroom apartments in West Town via rental site Zumper to find out what price-conscious apartment seekers can expect to find in this Chicago neighborhood. 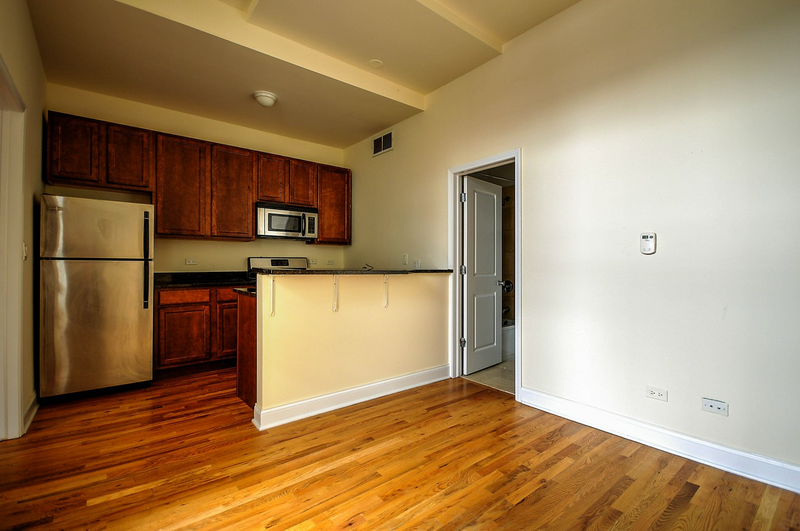 This studio condo, situated at 1436 W. Erie St., is listed for $1,300/month. Building amenities include on-site laundry, assigned parking and secured entry. In the unit, expect to find both air conditioning and central heating, hardwood flooring, a dishwasher, white appliances, granite countertops, wooden cabinetry, many windows, high ceilings and ceiling fans. Pet owners, take heed: cats and dogs are permitted. Here's a one-bedroom, one-bathroom apartment at 1830 W. Superior St. which is going for $1,350/month. Building amenities include assigned parking and secured entry. In the unit, you're promised hardwood flooring, high ceilings, stainless steel appliances, granite countertops, wooden cabinetry, a breakfast island, a large bedroom and large closets. When it comes to pets, both meows and barks are permitted. Then there's this apartment with one bedroom and one bathroom at 2120 W. Washington Blvd., listed at $1,350/month. The building offers assigned parking and secured entry. In the unit, expect an open living room floor plan, a balcony, large windows with vertical blinds, both air conditioning and central heating, hardwood flooring, a dishwasher, stainless steel appliances, granite countertops, wooden cabinetry and in-unit laundry. Sorry animal lovers, pets are not welcome. This one-bedroom, one-bathroom apartment, situated at 2614 W. Superior St., is listed for $1,490/month. Building amenities include on-site laundry, assigned parking and secured entry. In the unit, the listing promises high ceilings, hardwood and tile flooring, a balcony, a dishwasher, white appliances, wooden cabinetry and ceiling fans. Cats and dogs are not welcome.